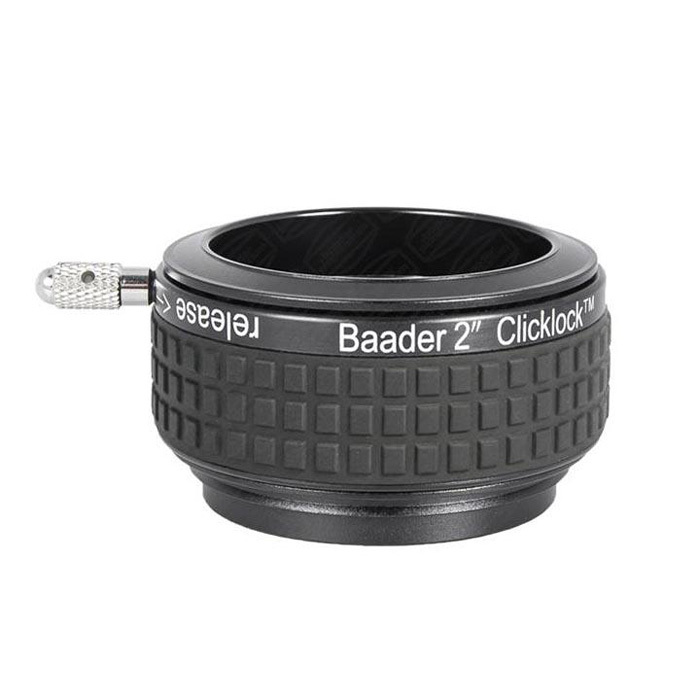 The Baader Planetarium 2" Click-Lock Eyepiece Clamp fits onto Baader's Diamond Steeltrack focusers and replaces the supplied standard clamp. The telescope side of this adapter features an S58 deovetail ring for attachment to the focuser. With a simple twist, 2" eyepieces and accessories are instantly locked with such strength that they can literally support an entire telescope without slippage. Simply grasp the rubber-knurled outer collar and lightly twist - that's all there is to it. Knurled clamp lever is also provided for added convenience and to give a quick visual indication of clamp position. 20 degree rotation is all that is required. Very low force required to rotate. Note that this clamp adds about 31mm to the optical path length so it might not be suitable for use with the Baader Diamond Steeltrack focuser for Newtonian telescopes # BDS-NT. Also note that this item will not work with Baader's older non-Diamond Steeltrack focusers.